Tresmegistus, 2004. 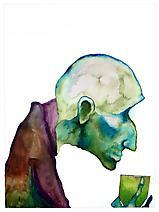 Watercolor on antique embalming table, 23 x 7 x 38 in. Baphometh, 2006. Watercolor, 30 x 22 in. 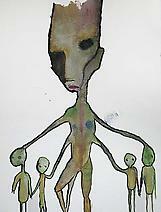 Anaclitism, 2001. Watercolor, two framed paintings, 30 x 22 in. 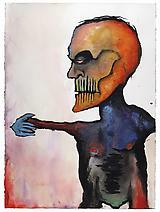 "The man who eats his fingers," 2006. Watercolor, ink, acrylic, chamomile tea (caffeine free), 30 x 22 in. Ready or not tot, 2006. Watercolor, 30 x 22 in. 500 cent, 2006. Watercolor, 30 x 22 in. Self Portrait (The Grey Series), 1999. 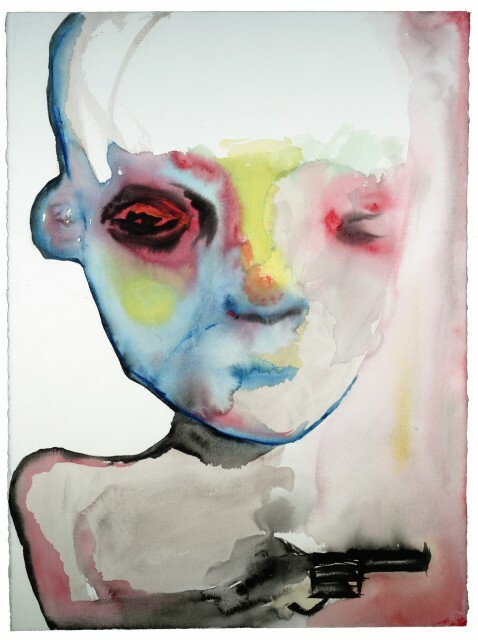 Watercolor, 41.5 x 33.25 in. When I Get Old, 2002. 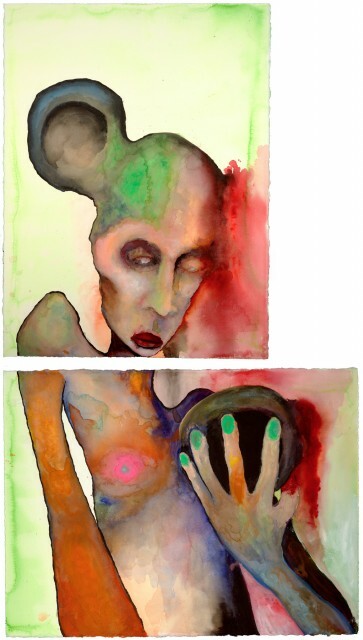 Watercolor on Arches, 30 x 22 in. Mouth of War, 2002. Watercolor, 30 x 22 in. There's no aids in space, 2005. Watercolor, 24 x 18 in. 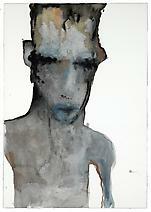 Übermensch, 2002. 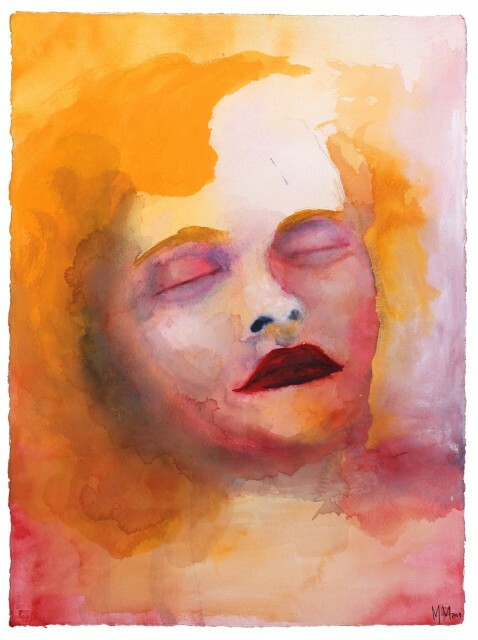 Watercolor, 30 x 22 in. 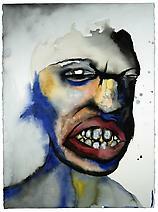 "Scald not your lips in another man's pottage," 2004. Watercolor, 30 x 22 in. 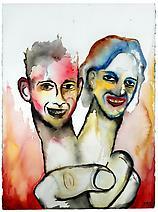 Die Deutsche Kampferin, 1999. Watercolor. 60 x 40 in. Pretty Persuasion, 2007. 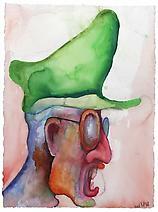 Watercolor, 30 x 22 in. Isani, 2008. Watercolor, 30 x 22 in. I've got my arm around no one, 2005. Watercolor, 30 x 22 in. The new slaves of Big 500 Cent. 2. 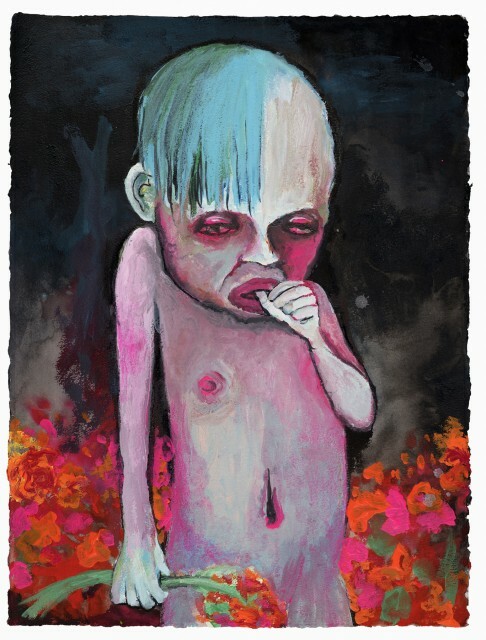 (Albino hermaphrodite opium harvester), 2005. Watercolor, 30 x 22 in. The new slaves of Big 500 Cent 1. 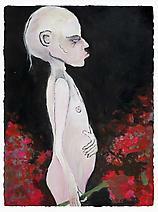 (Albino hermaphrodite opium harvester), 2003. Watercolor, 30 x 22 in. Trainables, 2000. Watercolor, 30 x 22 in. Elizabeth Short as Snow White, "You're sure you will be comfortable?" 2006. Hair, watercolor, 40 x 60 in. 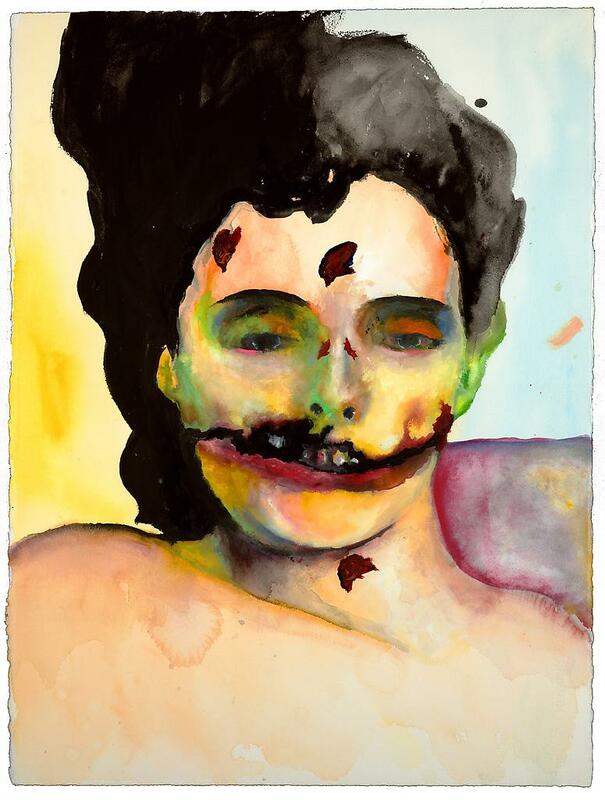 Elizabeth Short as Snow White (A Smile I), 2006. 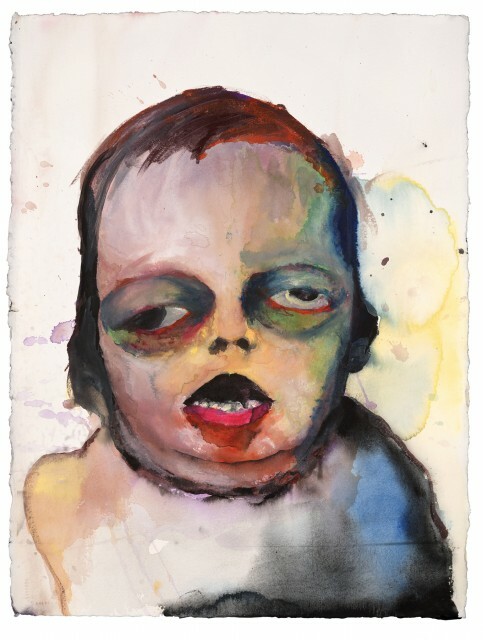 Watercolor, 30 x 22 in. Elizabeth Short as Snow White (A Smile II), 2002. Watercolor, 30 x 22 in. Everyday it hurts to wake up, 2002. Watercolor, 30 x 22 in. JonBenet Ramesey as "Sleeping beauty" II, 2004. Watercolor, 30 x 22 in. Masquerade, 2000. Watercolor, 30 x 22 in. 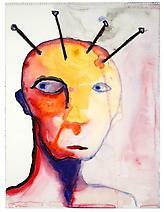 Crop Failure, 1999. Watercolor, 30 x 22 in. The Carpenter, 2000. Watercolor, 20 x 14 in. 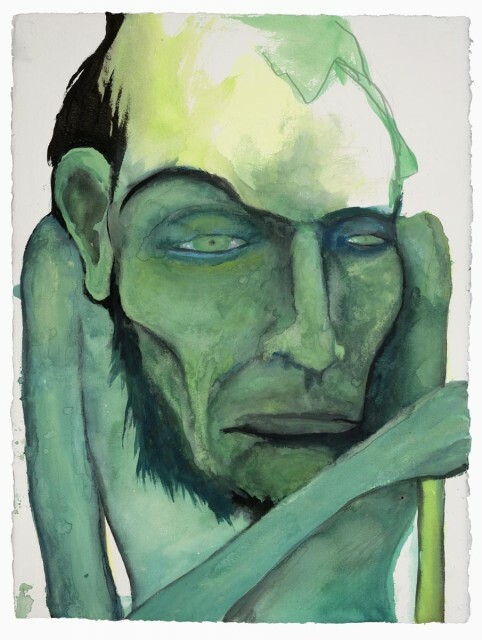 The Green Whore of Love (Series I), 1999. Watercolor, 20 x 14 in. (November 4, 2008, Cologne, Germany) Multi-talented artist Marilyn Manson, legendary for the cult status of his music career and persona, has simultaneously been creating a large and remarkable body of painting over the past two decades that will be revealed for the first time in the U.S. this December during Art Basel Miami. 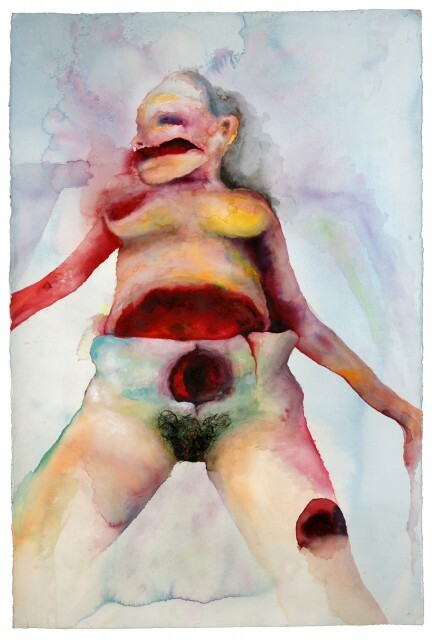 Just as Mansonʼs lyrics are provocative, driving the expressive form of music to its limits, the artistʼs paintings, though aesthetically pleasing, play with the grotesque and confront the viewer with the dark side of the American Dream – its obsessions and pitfalls. This exhibition of more than twenty paintings is presented by the Cologne-based Galerie Brigitte Schenk in cooperation with 101 Exhibit, a dynamic new art space in Miamiʼs design district. The show will remain on view through February 2009. 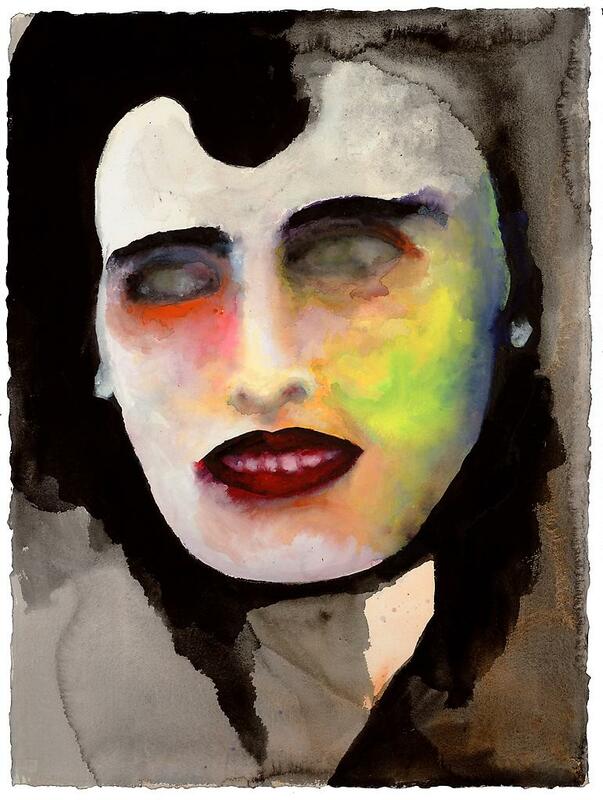 The titles sometimes lighten up the darker, more sensational events that Manson evokes, inclding: study of the murderess Elizabeth Short, celebrated in the media as the Black Dahlia, bears the title “Elizabeth Short as Snow White, Youʼre sure you will be comfortable?”, “Jon Benet Ramsey as Sleeping Beauty II”, and “Übermensch” painted in honor of Christopher Reeve. Several others allude to Mansonʼs own angst, as in “Green Whore of Love (series I),” “Iʼve got my arm around no one,” and “The man who eats his fingers” (which the artist specifically notes was produced with caffeine-free chamomile tea). The artist known as Marilyn Manson took his pseudonym from the names Marilyn Monroe and Charles Manson – figures whom he sees as reflecting the ultimate and most disturbing dualism of American culture. From the beginning of his career as a musician, Manson has also been active as a painter. 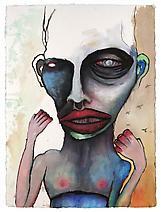 The oldest of his surviving pieces date back to 1995. 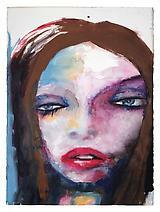 After a brief “grey period” Manson began painting watercolors in 1999. 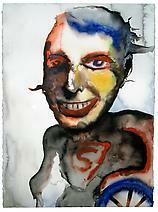 His manic creativity has been documented in a number of exhibitions. 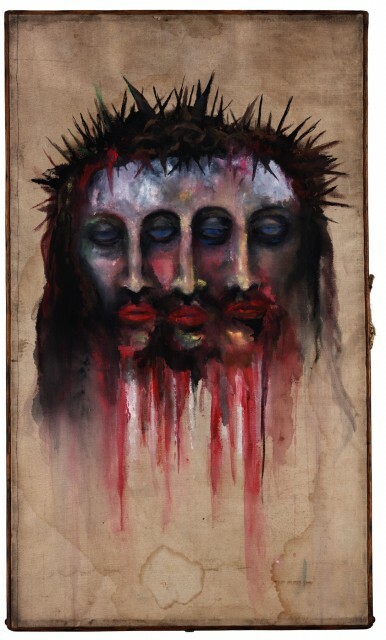 In 2002, he had a show in Los Angeles and two years later presented his “Trismegistus” piece – a large three-headed Christ – in Paris and in Berlin. 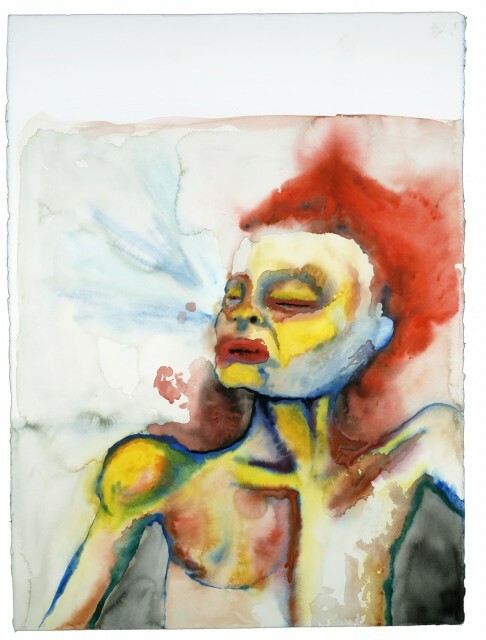 In 2006 Manson opened a temporary art gallery in Los Angeles, and in April 2007, recent works were exhibited at Galerie Brigitte Schenk, Cologne. 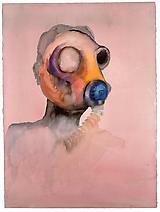 Starting her career in the German branch of the Dia Art Foundation, Brigitte Schenk worked with Joseph Beuys and A.R. 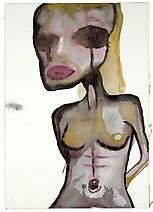 Penck, and as a private curator until she launched her own art gallery in Cologne 14 years ago. The gallery specializes in modern and contemporary art of all disciplines. The program also focuses on contemporary Arabian art, and Schenk has organized exhibitions and projects with the United Arab Emirates for the past eight years including: curating the collection for H.H. Shiekah Hoor Al Qasimi, a collaboration with Ilya and Emilia Kabakov, and an exhibition of Thomas Walther for the Sharjah Art Museum. 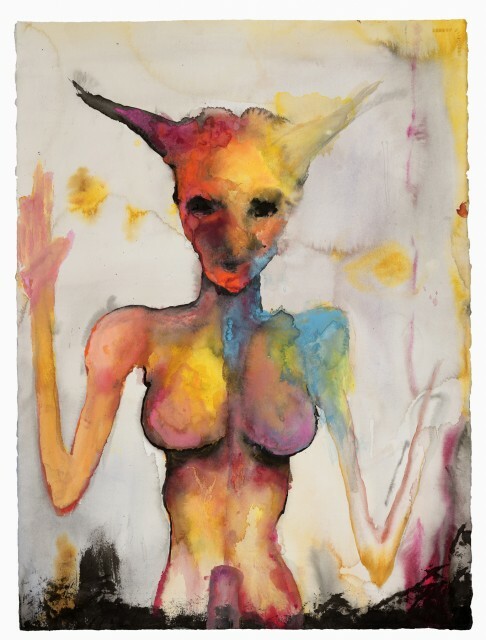 Marilyn Manson is one of the more recent artists to join the gallery, which also shows Hans Peter Adamski, Curtis Anderson, Klaus Fritze, Ilya and Emilia Kabakov, Shahram Karimi, A.R. Penck, Mariy Zerres and many more.